This is the third action packed book in Martin Archer's acclaimed "Soldiers and Marines" series. 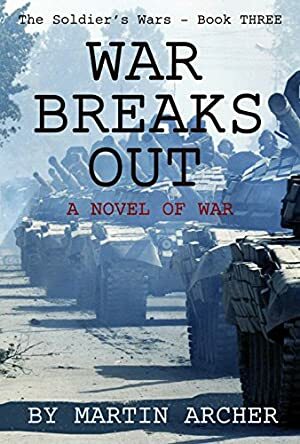 It describes what would have happened if a war had broken out between the Russians and NATO when the Russians and their allies invade Germany in an effort to regain control of all of eastern Europe - and a mature Chris Roberts unleashes a host of special operations and brings the entire United States Marines to Europe in a desperate effort to win the all out air, sea, and land battles that result. This book was £2.95 when we started tracking it. The price of this book has changed 8 times in the past 1,530 days. The current price of this book is £3.99 last checked one hour ago. This lowest price this book has been offered at in the past six months is £1.99. The lowest price to date was £0.99 last reached on March 6, 2016. The highest price to date was £3.99 last reached on August 11, 2016. We last verified the price of this book about one hour ago. At that time, the price was £3.99. This price is subject to change. The price displayed on the Amazon.co.uk website at the time of purchase is the price you will pay for this book. Please confirm the price before making any purchases.